When building my i3 I decided I wanted to do things from scratch since I was unable to purchase a kit up at front. So, little by little I acquired pieces of my next machine. I purchased the frame from seemecnc, electronics and motion components from different sellers on E-bay and printed all the parts I needed on my Printrbot LC. I was initially going to go with a Printrbot Ubis hotend for its reliability but then decided to spend a little more to try out an all metal design. The E3D metal hot-end was hot on IRC so I went ahead and purchased one. I had everything moving and assembled but just needed to add the hotend. However, a rearrangement of my office and my wife and I having another child stopped most production on my i3. I’m happy to say that now that things are more stable I’ve been working on it again. 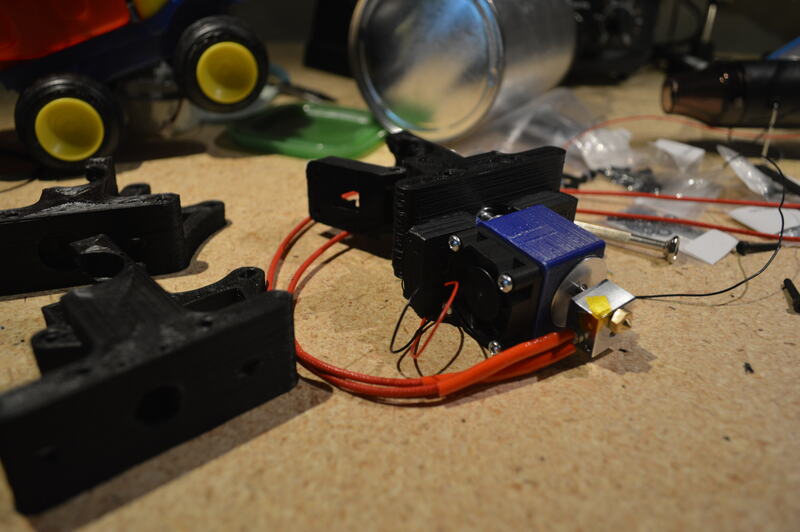 Over the past few days I repaired my Printrbot and printed out the right extruder for the x-carriage design I had installed. The hotend looks beautiful but it makes me wish I’d decided to do a bowden design. Oh well, maybe I’ll do that for my next build.